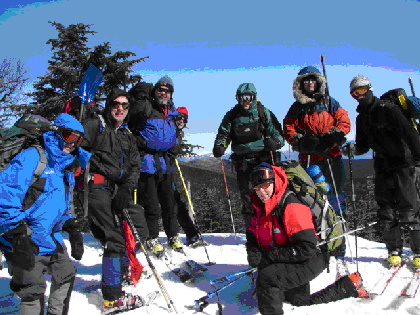 Join an MTR Course to improve your knowledge of extended outdoor work in a winter environment for the purpose of just enjoying the winter more, or use this experience for becoming a Search and Rescue volunteer with FEMA or within your local NH SAR community partners. For additional information, please contact the MTR program supervisor with questions by clicking this email link. Check out the detailed descriptions for both MTR courses and keep an eye on Calendar for details. Additional MTR courses can be found by visiting Eastern Division NSP’s website or exploring courses hosted by neighboring NSP Regions. NH Region teaches an annual LEVEL ONE MTR course every autumn just before Thanksgiving. Check out the Calendar under MTR. Training is a combination of classroom and outdoor practical exercises designed to help you achieve your goal of becoming more comfortable and safe in winter outdoor activities. The LEVEL TWO MTR course is taught once every two years, typically on the even number winter seasons during February. Less classroom oriented, the course revolves around a high mountain winter camping field exercise. The idea is to experience and practice MTR skills by snowshoeing or backcountry skiing to the top of Mount Mousilauki for an extended overnight trip. Mountain Travel and Rescue Level 1 course is an elective course for NSP patrollers that have an interest in becoming knowledgeable in backcountry travel and rescue procedures. This course is also open to the public with similar interests. Prerequisites: A desire to learn and have fun “safely.” You will be expected to read all Chapters with emphasis on 9, 10, 16, and 17 of the NSP MTR manual, which will be sent upon a paid registration. If you are not a member of the NSP it is recommended that you have taken a basic first aid or first responder course but it is not required. Manuals: An NSP MTR manual is included in the cost of this course (see below) and will be mailed directly to your home. In order to receive a manual, you need to register and pay for a course. (See below) If you have already purchased a manual, the book fee can be deducted from course costs, speak with the Instructor after you receive confirmation of course registration). Logistics: Class will begin promptly at 8:00 am. We recommend that you plan on arriving at about 7:30-7:45 am. You will need to bring a notebook and a pen or pencil to take notes. Students should be prepared to work through the lunch period if needed. Students must bring all equipment and be prepared for overnight camping plus classes in the outdoor environment. Pack and inventory all personal and group equipment guided by the checklist in the appendix of MTR manual (page 147). Final packing will be conducted during class. The class will go continuously through the entire weekend up to 5:00 pm on Sunday. Agenda: The MTR1 course is made up of 17 lesson fundamentals. These lessons cover topics including Personal Survival, Travel, Back Country Considerations, and Search and Rescue skills. These are all reinforced with an overnight camping exercise and field exercises for Navigation, Technical Emergency Rescue Techniques, and Search and Rescue. Tentative schedules will be available one week prior to class to help you plan. Pre-Course Reading: Please BE SURE to read Chapters 9, 10, 16, and 17 of the MTR manual before coming to class. Questions are welcome, please use this email link. The following is not intended to answer all possible questions that arise for those enrolled in the course, so if you still have questions please feel free to contact the MTR Supervisor. Class Theme? Safety and hands on. Schedule? The draft document will be provided. The schedule is subject to change. Camera? Yes, please bring your camera and please take lots of pictures. Food and Water? You will be expected to feed and hydrate yourself during the entire weekend course. The recommendation is to have two litters of water per day for cooking, drinking, and sanitation. Dehydrated food is recommended (for example Mountain House brand found ar REI Coop) for Saturday supper and Sunday breakfast which requires only hot water. “Pocket food” and travel water for eating and drinking on the go all day is recommended for in the field on both Saturday and Sunday. Clothing? Saturday you are in class with outdoor field work to perform navigation exercises and to set up your camp. Be prepared for all types of weather because we will spend time outside both days, rain or shine. Sunday you are in the field for approximately seven hours. For the field exercises, you should wear your most comfortable hiking boots, gators, protective eyewear, gloves, and suitable clothing to go through thick underbrush in any kind of weather including rain, sleet or snow. Toilet? You’ll have scheduled break times and general access to some portion of the base area facilities at all times. Field Latrine? There is no field latrine; a nighttime pee bottle is helpful. Navigation Tools? If possible a field compass with a sighting mirror and adjustable declination, “UTM Grid Reader” (aka protractor) with multiple UTM scales is available for$10 at REI Coop or Amazon, a clear plastic straight edge 8 – 12 inches, notepad, writing instruments, and calculator. Please bring your GPS with spare batteries but don’t go out and buy one for this class. You will get to see and learn about many different GPS models during the course. Personal Equipment? First aid kit, tick spray, short (36”) piece of practice rope, walking sticks (ski poles), sleeping bag, ground pad, tent, stove, spare fuel, utensils, something to heat water in, bowl/plate, insulated drinking cup, camp lighting, walkabout lighting (LED headlamp), spare batteries, walkabout pack for loading food, water, clothing, tools, personal hygiene, and whatever you deem necessary to be comfortable for two days and one night. Some people bring a tent candle. Night Time? The classroom building will be locked at night, but the patrol room will be open for emergencies and toilet. Precautions? No open fires are allowed, we use cooking stoves only. Food should be kept in sealed containers to keep animals away, no open latrines, and please don’t leave the camping area without notifying someone. Miscellany? If you have doubts about anything, please bring it along. Items can be left in the vehicle which is just minutes rather than miles away. You can reference the NSP MTR Manual for all this information. More Questions? The goal is to make this a safe hands-on experience for you and your classmates. So please ask as many questions at any time — but better sooner than later. Email your Instructor of Record, found in your course registration confirmation or use this link to email the MTR Supervisor. Mountain Travel and Rescue Level 2 course is an elective course for NSP patrollers that have an interest in expanding their knowledgeable in backcountry travel and rescue procedures. This course is also open to the public with the same interests. Prerequisites: Mountain Travel & Rescue Level 1 and Avalanche Fundamentals & Rescue NSP courses or equivalent as determined by Eastern Division MTR supervisor. Complete Pre-course material assignments and have essential equipment required for field exercises. Manuals: An NSP MTR manual is not included in the course fee and must be purchased separately. Contact Instructor of record (IOR) if you are not an NSP member. Logistics Session 1: Class will begin promptly at 8:00 am; we recommend that you plan on arriving at about 7:30-7:45 am. You will need to bring a notebook and a pencil to take notes. Students should be prepared to work through the lunch period if needed. The student must bring all equipment/food and be prepared for overnight camping plus classes in the outdoor environment. Pack and inventory all personal equipment using the checklist provided. The final packing will be conducted during class. The class will go continuously until 3:30 pm on Sunday. Some group equipment will be distributed during class. Logistics Session 2: Trailhead departure NLT 8:30 am for continuous field exercise until 2:30 pm two days later (more details provided at Session 1). Agenda: The MTR2 course is made up of 17 lesson topics. These lessons cover topics including Personal Survival, Travel, Back Country Considerations, and Search and Rescue skills. These are all reinforced with an overnight camping exercise and three-day field extended exercise with overnight camping for Navigation, Technical Emergency Rescue Techniques and Search and Rescue. Completion: When completed you will have the knowledge and skills to complete more difficult field operations as a member of a Search and Rescue organization and to assist in the coordination of extended SAR operations. Registration: Click on the NH Region’s Events Calendar found on this website and look for the various MTR course offerings. Questions are welcome, please use this contact link to email the MTR Supervisor. Schedule? Will be sent out by email one week prior to the course start date. Food and Water? You will be expected to feed and hydrate yourself starting Saturday morning until you leave Sunday at 5 PM. Breakfast is available at the meeting lodge (pay your own way). Coffee and hot water/tea will be provided Saturday morning and Sunday in the afternoon. Clothing? Come dress to go into the field! We will be in the field most of the time even in inclement weather, expect it to snow. This is a chance to see if “what you bring, will work” in the field at altitude. Toilet? You’ll have scheduled break times during classroom sessions. Field Latrine? The field latrine will be designated at the Campsite by leadership; a nighttime pee bottle and Ziplock bags to carry out toilet paper. Navigation Tools? If possible a field compass with a sighting mirror and adjustable declination, “UTM Grid Reader” (aka protractor) calibrated to 1:24000 example $10 at REI Cooop or Amazon, a clear plastic straight edge 8 – 12 inches, notepad, writing instruments, and calculator. Personal Equipment? See separate list provided after registration and ask questions. Friday will be an opportunity to bring what you have to test it prior to the field exercise. Some items may not be needed for the first session but will be required for the field exercise. You must inform the Instructor if you don’t have items on the list. The Region has accumulated lots of equipment over the years and may be able to lend out some items. Team/group equipment? If you have a 4 season/expedition tent that sleeps 2 or more please bring it. You will be part of a tent team. If you don’t have a tent make sure that you contact the Instructor so plans can be made to rent a tent if necessary. Lodging Friday Night? Typically bunkhouse accommodations are made available which include indoor toilet and sink and a shower. Precautions? No open fires, cooking stoves only, food should be kept in sealed containers to keep animals away, and please don’t leave the camping area without notifying Instructor. Miscellany? If you have a doubt about something, bring it. There will be plenty of time to evaluate the gear prior to setting off on any extended exercises. The contents of this FAQ is not intended to answer every possible question so if you still have any questions please feel free to ask. No question is out of bounds because our goal is to make this a safe hands-on experience for you and your classmates. Please ask at any time by contacting the Instructor of Record on your Course Registration Confirmation email, or contact the MTR Supervisor. To Quote John Caron: “Remember “…your secondary, can soon become someone’s primary!” Or was that some other masked man?